We have been collecting traditional shop signs for more than six years now and we find them extremely decorative and attractive, but rather difficult to get these days. By Levy, Sneider and Gibney, Chronicle Books 1991. I quote a few parts of it. 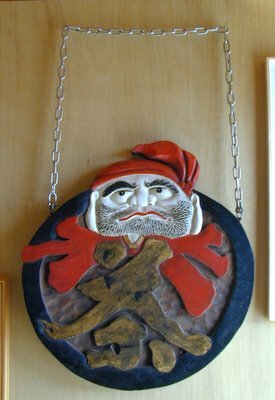 The shop signs had two functions, first to announce the business of the shop in an appealing manner and second to brave the weather, since they were mostly mounted outside the store, hung on the wall or put under a small roof. Usually they were not made for asthetic reasons, but were utilitarian in their concern. In their simplest form, no words were used. An illiterate public could not have read them: crossed radishes, a string of prayer beads, a vinegar cask was sufficient to convey the message. 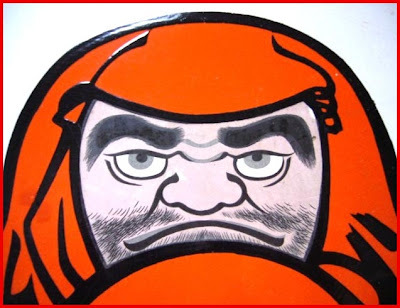 In the beginning of the Edo period simple shapes and forms dominated, but later laquer, refined calligraphy, gold and ukiyo-e style images were also used. 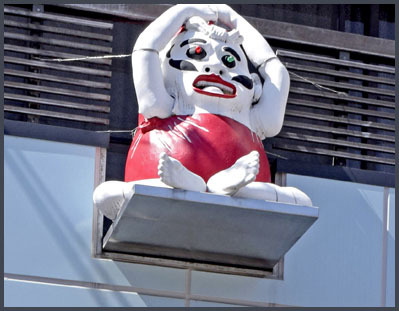 But signboards were not considered a traditional art form and most old signboards were replaced with shiny new metal and neon ones. Nowadays it is hard to find any good ones for sale any more in local antiques shops. 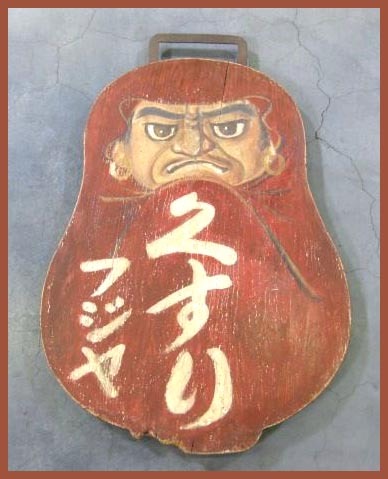 In Edo times, the kanban was a symbol to the merchant as important as the sword or military banner was to the samurai. 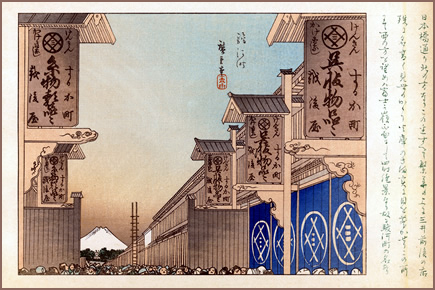 The kanban he used to designate and decorate his stores shed an interesting light on Japan's economic history as it passed from feudal society to modern state. 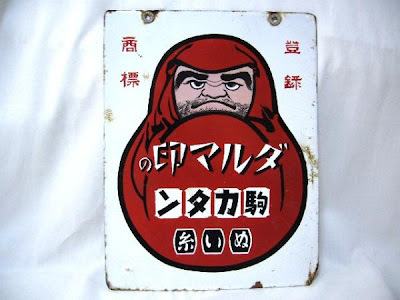 The connection to Tobacco and Daruma is less obvious. 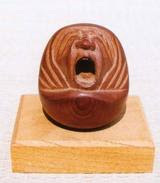 "Tobacco being conductive to contemplation, Daruma now enjoys immense vogue as the patron saint of smokers. 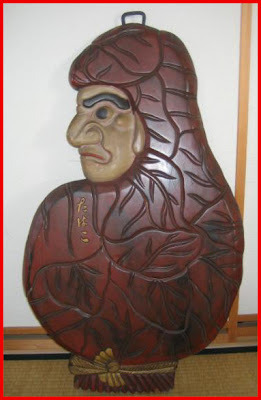 His gloomy eyes and bearded jowls stare at you from all the Japanese tobacco shops; he has become the wooden Indian of Japan!" 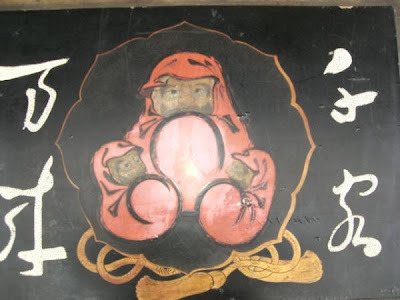 The opening words in this account perhaps also identify the only plausible connection between Daruma and tobacco. 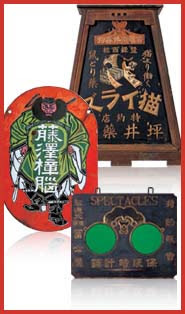 Maybe from the Meiji period.
. Shop signs with Dragons .
. Shop signs with Tengu 天狗 . What few Japanese realize is that these fixtures of Japanese tourism were actually invented in the United States nearly 150 years ago. In 1874, an American illustrator named Cassius M. Coolidge applied for a patent on what he called "comic foregrounds," a canvas painted with a cartoonish scene that he marketed to professional photographers. mizuchaya no kanban musume 水茶屋の看板娘 "advertising servant girl"
signboard girl, they worked outside the shop, trying to attract customers.